A friend gave me some old fir boards torn out of her attic. They were getting in the way where I stacked them in the shop, so I decided to mill them down before storing them. 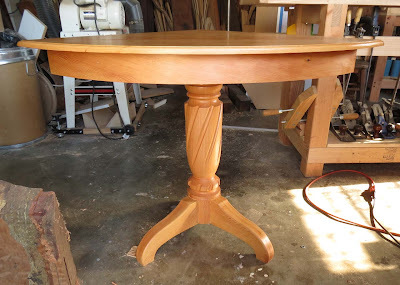 But once I started cutting, I got a little carried away and made a table top to go with the spindle I made in the last post. 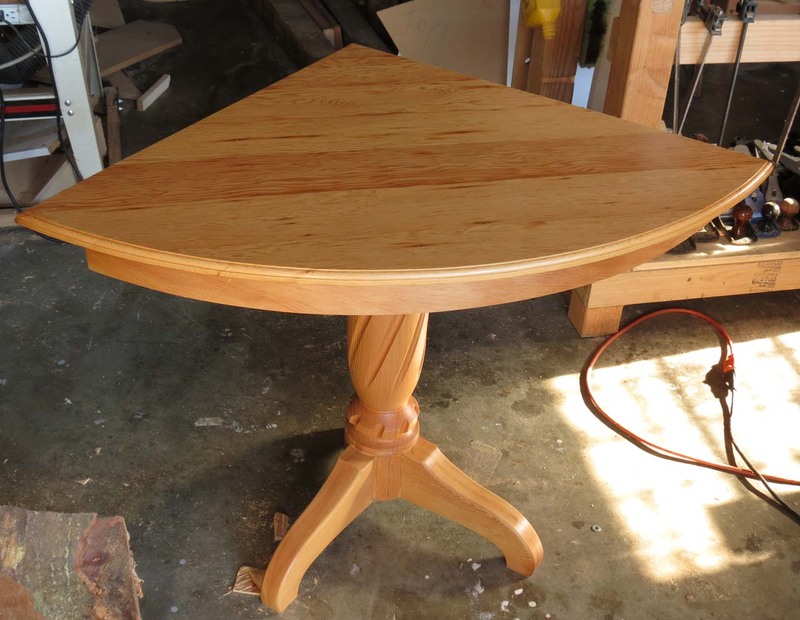 The top is a 24" radius quarter round, with the leg centered roughly in the table top. 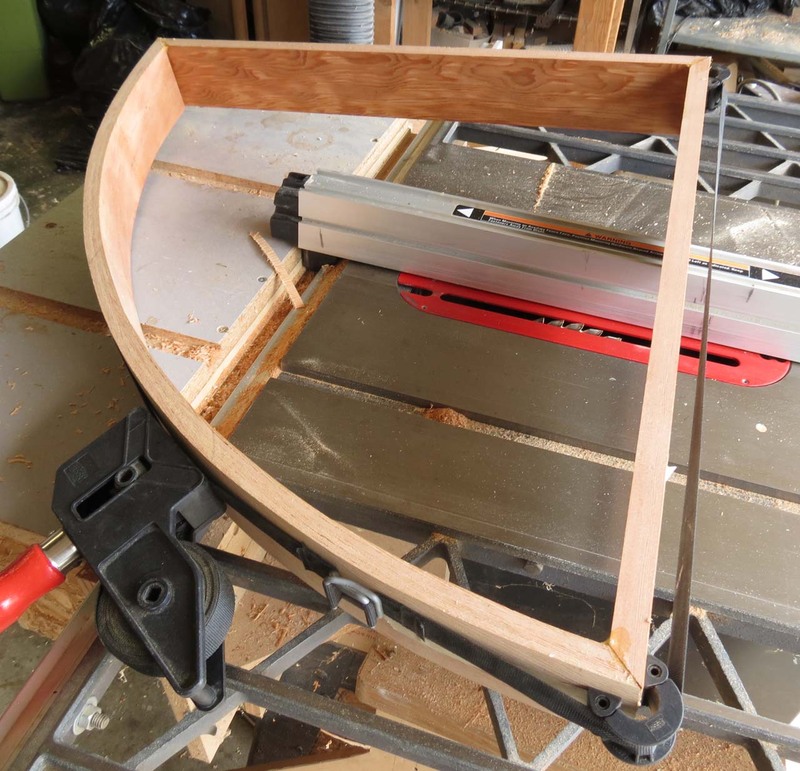 The curved front apron was made of several thin pieces of stock laminated around a curved fixture and glued. 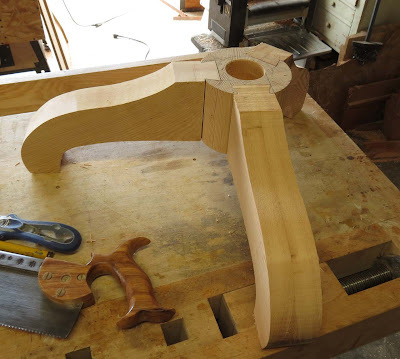 The tripod base with the legs attached by dovetails. The front two legs are at right angles to each other and the rear leg is much shorter. One major mistake was the thin dovetail web between the front legs, that ended up being a weak point I struggled with later. It was interesting to build a traditional-looking piece like this. Spindle-turned work always seems to lead in that direction, and in this case, it forced me review some basic skills. It was a good time for that review -- I made a couple of mistakes that could have been avoided if I was a bit more in practice. It was a pretty quick job, and a lot of fun. And it replaces a really ugly folding table in the corner of my living room. bloomin good work mate,given me an idea for some old attic planks kicked into the back of the shed,new they would come in useful one day, MAC.